Happy Labor Day! I just can't believe that it is September already! This is always a crazy time of year for us - school starting, birthdays (umm, MINE! ), going to the Kansas State Fair (don't laugh - it's more fun than you'd think!)! Lots to do! Here are a couple of things that I created for the A Muse Newsletter! Are you loving the new format?? I think it's awesome! 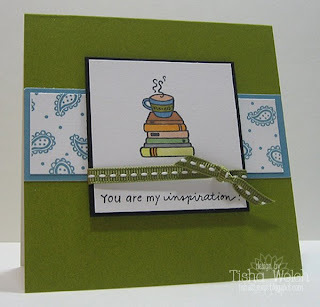 Super quick and simple "school supply" card! I was thinking masculine, give-it-to-your-favorite-male-teacher kind of card! I didn't even put any sparkle on this card! But I did use the awesome new color of A Muse ribbon-palm!! Super Goo!! 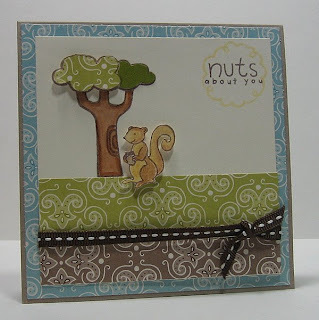 This was for our "Teacher Gift" feature in the A Muse Newsletter! I think I was mostly inspired by my new "Drippy Goo" Punch! Love that name! This is a bottle of Purell hand sanitizer, quickly covered with A Muse Kitchen orange paper! 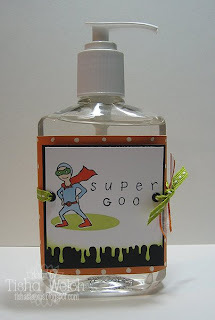 The "Super Goo" is stamped with my sadly discontinued Karen Foster 1/2 inch snap stamps!